The glitz, the glamour, the fans – the real estate. It’s all part of being a famous celebrity. Imagine flying to a dream destination (in a private jet, of course), piling into a plush limo and pulling up to a jaw-dropping home on pristine grounds. Whether it’s a historic mansion in New Orleans or a luxury villa in Lake Como, A-listers sure know how to vacation. Just in time for the upcoming spring/summer travel season, here is a look at 11 celebrity vacation homes around the world! 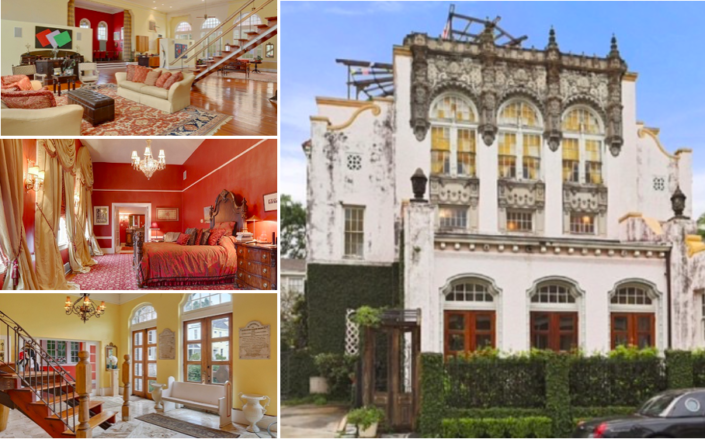 Beyonce & Jay- Z’s Historic NOLA Mansion: From its classic French Quarter architecture to its stunning decor, it is no wonder Queen Bey and her mogul man chose this 1920’s mansion to lay down their head to dream. Located in the Garden District, the 13,292 square foot pad boasts seven bedrooms, eight bathrooms, a library and a garden roof. The power couple purchased the home in 2015 for a cool $2.6 million USD. Justin Beiber’s Hawaiin Paradise: The young singer is known for his catchy songs as much as he’s known for his wild antics. So where does the Beibs like to wind down? None other than breathtaking Hawaii. The Canadian superstar rented this 8,100 square foot mansion for a jaw-dropping $5,500 per night and enjoyed its private golf course and two-story waterslide. 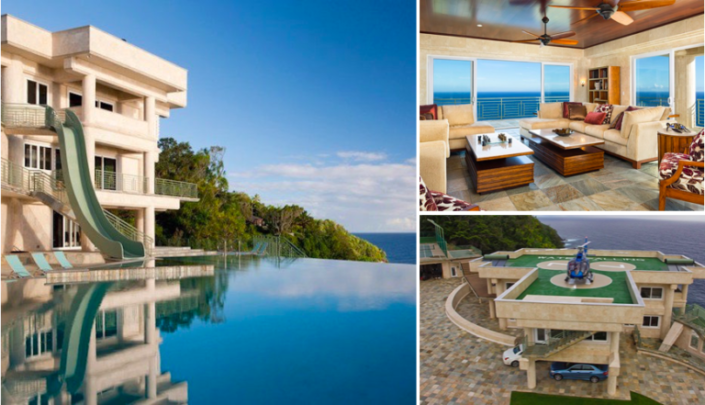 The mansion’s $26.5 million USD price tag also comes with a private helicopter pad and panoramic views of the ocean. Not too shabby, Justin! Celine Dion’s Floridian Retreat: Another Canadian songbird who enjoys a lavish getaway is Pop diva, Celine Dion. When the singer isn’t belting out her greatest hits in Las Vegas, she retires to Jupiter, Flordia, where she owns this sweet piece of land – 5.5 acres to be exact. The property’s 10,000 square foot, five bedroom mansion was put on the market in 2016 and the lucky purchaser will be just a stone’s throw away from celebrity neighbours, Tiger Woods and Michael Jordan. Sean ‘Diddy’ Comb’s Hampton’s Hideaway: This modern waterfront estate is the site of P.Diddy’s famous annual white party, where A-lister’s come dressed in their best whites to mix and mingle with other A-listers. The East Hampton home is now available for rent, so for those looking to host their very own white parties from Memorial Day to Labour Day, $200,000 USD will do it! 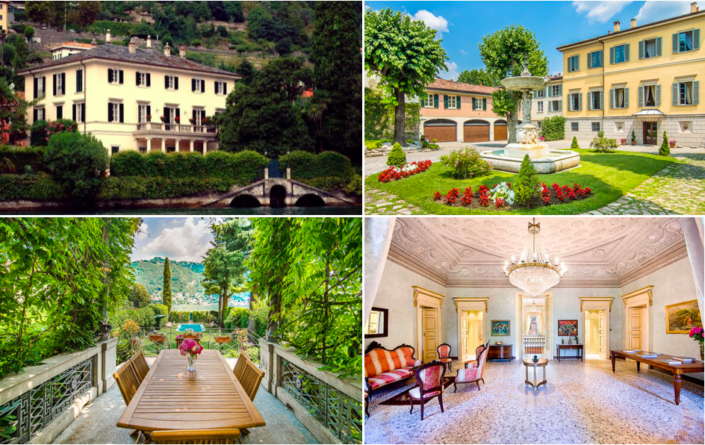 George Clooney’s Italian Escape: Located on the hills overlooking incredible Lake Como, George Clooney’s 18th-century Villa Oleandra in Lagilo is the stuff dreams are made of. Pale ivory stucco and stark black shutters come together to create a classic Italian aesthetic to die for and the villa’s outer architecture is only the beginning. Through the grand front doors of the home are ten bedrooms, eight and a half baths and a wine cellar. For those looking to experience a day in the life of silver-fox, Clooney, the villa is available for rent at $4,800 per night at a seven-night minimum. Worth it. 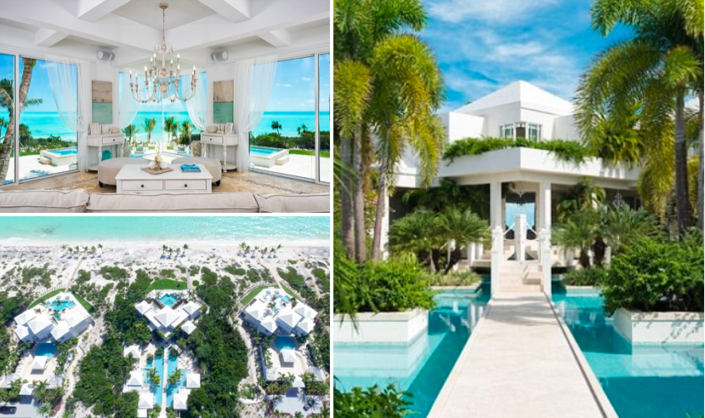 Kylie Jenner’s Turks and Caicos Sanctuary: The youngest of the Kardashian-Jenner sisters celebrated her 19th birthday in this awe-inspiring $35 million USD Turks and Caicos estate. Lounging on a sprawling six acres, fit with three villas, a tennis court, waterfall, personal chef and butler, the mini-mogul surely had no problem welcoming another year in her charmed life. Taylor Swift’s Rhode Island Residence: This 1930’s East Coast colonial has been the scene for many famously documented 4th of July parties hosted by Miss. Swift herself. Her closest supermodel friends gather here annually to frolick in patriotic swimsuits and adorable onesie pyjamas while enjoying everything the five-acre estate has to offer, including its seven tastefully decorated bedrooms and nine spa-like bathrooms. Johnny Depp’s Provençal Village: “There must be more than this provincial life” may have been the tune stuck in Johnny Depp’s head when in 2016, the movie star put his French village, Plan De La Tour, on the market for an impressive $63 million USD. The petite 19th-century provençal village is located 10 miles outside of Saint-Tropez and includes a dozen structures other than the main house, which itself boasts five bedrooms and three and a half baths. Leonardo DiCaprio’s Palm Springs Pad: Where does the “King of the World” get away from the hustle and bustle of Tinsel Town? 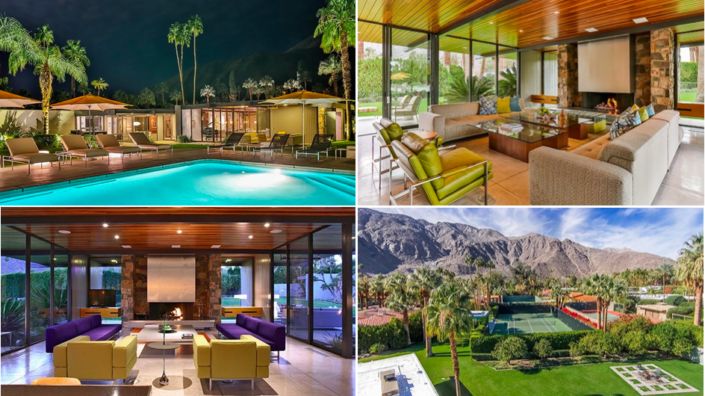 To this 7,022 square foot Palm Springs property. The seven-bedroom estate is completely private and totally chic with a guest house, pool and tennis court. For those with $4,500 USD to spare, Leo’s pad is up for rent! 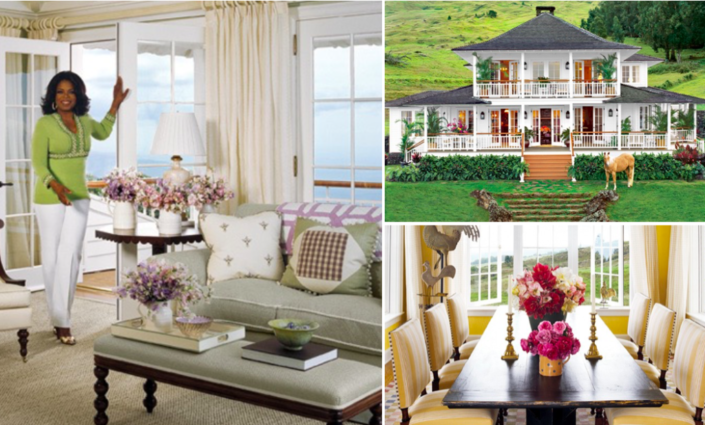 Oprah’s Heaven in Hawaii: Oprah, the queen of giving back, has treated herself to her very own sanctuary located in Hana, Hawaii. Situated on 163 acres of lush Hawaiin land, the 21st-century farmhouse is home to not only Oprah but to several horses as well. Oprah worked with her interior decorator, Ellie, to design the home to perfection and it was then famously featured in O Magazine. Naomi Campell’s Eco-Friendly Eye of Horus Home: Yes, the title very accurately describes this lavish vacation home gifted to the supermodel on her 41st birthday by her billionaire boyfriend in 2011. The 25-bedroom, dome-shaped home with surrounding grounds landscaped to look like the legendary Egyptian Eye of Horus, is fittingly located on Cleopatra Island in Turkey’s Gulf of Gökova. The island is completely private and the home’s water, energy and food are self-sufficient.